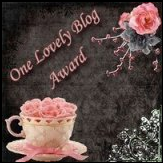 I've received two blog awards recently - the One Lovely Blog Award from Cristin at Simplified Bee and the Honest Scrap award from Lucy at Four Walls and a Roof. I'm flattered to be so awarded since both are real live interior designers and classy ladies to boot. Elizabeth at Absinthe and Orange - For fearless, honest DIY projects and for sucking me into the whole refashioning old clothes thing. Alexis at One Grand Home - Great decorating deals, including 100 DIY headboard ideas. Struggling to be Stylish - For being down to earth, funny and practical. Kasey at Thrifty Little Blog - Best explanation of what to buy or not buy at a dollar store that I've read. Jill at The Good Life for Less - For cute cheap outfits. If the Lampshade Fits - Gotta love any blog with a category called Eat the Rich. 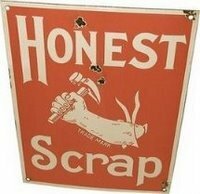 For the Honest Scrap award, I'm supposed to post 10 honest things about myself. Blog awards make me nervous. I have a hard time thinking of 10 honest things. Oh, here's something. I have a theory that people are alloted a certain number of words a day. Some people are given millions, so they start early in the morning and talk as much as possible to run through their share. Others, like me, get only a few thousand. So that's why by about 4 p.m., I've run out of words and I'm starting to blather. Sometimes this occurs way before 4 p.m. I pretend to be allergic to animals when really I just think they are gross. I write reminders on my hand. I watch with lurid interest programs like I Didn't Know I was Pregnant and Monsters Inside Me. I once had a dog named Puppy. I can put my foot behind my neck. Thank you! That's very nice of you. I can relate to your #4/5. I think the idea that all woman like to talk as much as possible is just a big myth. Thank you very much, that's really kind! Anyone who can put their foot behind their head has my immediate and sincere respect! Thanks so much for the shout-out! Since I know that you've probably read hundreds of dollar store posts, I'm taking this a a major compliment ;). I laughed out loud when I read that you pretend to be allergic to animals... I do that too! Although I do like dogs and cats - just from a distance. Hilarious post all round.